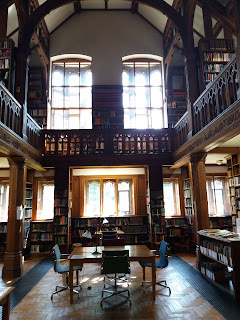 If you follow me on social media, you'll know that in addition to old houses and castles I also love book shops and libraries. 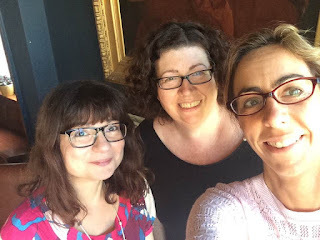 Last week I finally got around to visiting somewhere I'd always wanted to go, Gladstone's Library in Hawarden, with two of my friends from Novelistas Ink: Valerie-Anne Baglietto and Sophie Claire. It's a beautiful old building, built in 1906 to replace the original one, and is Grade 1 listed. We arranged our trip on the pretext of calling it a business meeting but although there was lots of talking, and much coffee and cake consumed in the cafe, there wasn't a lot of 'business' discussion! 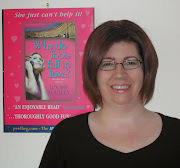 I'm sorry that my photos are a little bit blurry. The library is a place of work and understandably expects visitors to maintain complete silence. I became a little self-conscious about using my camera, which emits a cheerful electronic trill every time I take a picture, so I switched to using my mobile instead! Gladstone's Library is named after William Ewart Gladstone (1809-1898), who served four terms as Prime Minster - more than any other person. He was also Britain's oldest Prime Minister, finally retiring at the age of 84. He had a large personal library and was keen to make it accessible to others not so fortunate, donating over 32,000 of his own books - mainly theology and history. Legend has it that he carried the books between the family home at Hawarden Castle and the library himself, with only the aid of a wheelbarrow, his valet and one of his daughters. The library is now home to more than 150,000 books, journals and pamphlets. Some are over 400 years old, some are first editions. Some still contain Gladstone's personal notes written in the margins! The library is also a residential library and has 26 bedrooms available for anyone wanting to 'sleep' with the books! Anyone can visit but only residents and 'readers' can use the library (it is free to join). But there are short tours lasting about ten minutes, known as 'Glimpses', three times a day. The library also hosts various programmes and events, including their annual festival, Gladfest. There is a cafe, Food For Thought, open seven days a week, and conference rooms available for hire. All photos were taken by me, except the group shot © Sophie Claire.